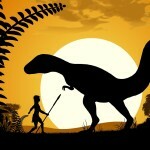 The existence of dinosaurs and the Bible – do they contradict one another? Many secularists would say they do. But what do the facts point to? Let’s take a look at the facts and see if we can settle this matter. This must always be considered from the very beginning. Why isn’t the word “dinosaur” in the Bible? There are also many cave paintings, carvings and sculptures in existence that not only predate the finding of dinosaur fossils, but go back hundreds, possibly even thousands of years from the discovery of dinosaur fossils. For example, the image to the right was found in a Cambodian temple that dates many hundreds of years before the discovery of dinosaurs in the fossil record. So, were dinosaurs in the Bible? So, are dinosaurs mentioned in the bible? You can very clearly see from the above mentioned verses that they are. Another common question is “Were dinosaurs on the ark?” and the answer is, probably. The flood occurred approximately 2,348 BC and it was responsible for the fossil record. Most of the dinosaurs were killed by the flood. Some were on board the ark (click the following link if you’re wondering how all of the animals fit in the ark) and could have gone extinct, or nearly extinct, shortly after, due to the drastically new environment that the global flood created. Many other animal kinds have gone extinct since then as well, due to the sin curse mankind has brought upon the world. However, we are not 100% sure that all dinosaur kinds have gone completely extinct! We are finding new animal, insect and plant kinds in remote locations of the world all the time. If the dinosaurs on the ark did survive after the flood and multiply, the rest may have been killed off in the ice age, which occurred after the flood and as a result of the flood. 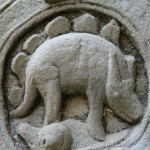 So how should Christians deal with the question of dinosaurs? We should deal with questions about dinosaurs in the same way we deal with any other question, first by taking the Bible at face value and then, secondary to that, with solid, observable scientific facts, which you will find supports the Bible, and love! The Bible is God’s Word. He has preserved it over the ages and we need not fear any new discovery. Not only has there yet to be a discovery that disproves the Bible, most of them have reaffirmed and solidified the legitimacy and reliability of the Bible. Click the following link for further information about the reliability of the Bible.